I have a small pool of recruiters who know my skill set and find work FOR me. That is where you want to be: having people looking for work FOR you. In this series of articles, I'm going to share some of my LinkedIn job-hunting tips with you. This week you'll get some tips on writing your headline and summary, choosing a profile photo, and how to garner recommendations. There is no way around it. You must have a strong LinkedIn profile. Most companies use LinkedIn to check out applicants. And recruiters are actively searching on LinkedIn for the best candidates. If you want to compete today, you simply have to have a strong online presence, and it all starts with LinkedIn. I created a custom URL for myself, as shown in the lower left corner of the image above (and there's a close-up below). When you are signed in and choose Edit My Profile, a gear will appear to the right of your current URL. Tap the gear and create a new custom URL for yourself. It looks professional and sets you apart. Notice that in my profile (the first image above), I listed previous companies I have done work for. Although you cannot tell in the photo, I linked to their business pages, if they have one. If you have your own business, create a LinkedIn page and link to it. Don't list "Looking for Work" as your headline. You're wasting valuable space to talk about yourself, and research shows recruiters react negatively to it. Use keywords and key terms. LinkedIn searches are based on keywords and key terms, so make it count. 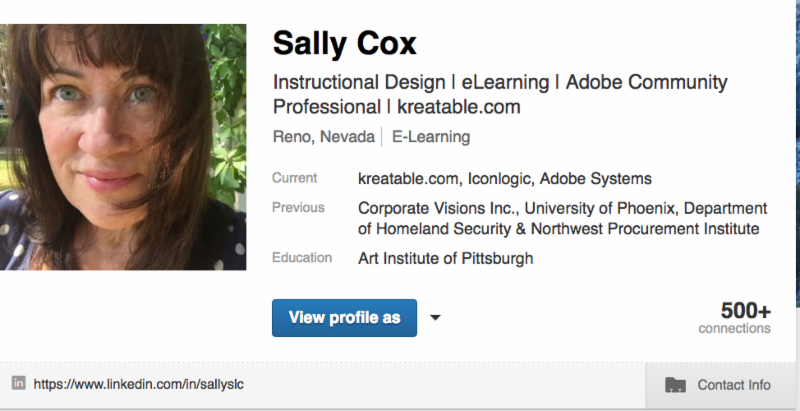 Use LinkedIn's search features to explore other profiles like yours and see what terms the professionals are using. Headline: distill your career to one sentence. It's a challenge but it forces you to decide what is important and get rid of the rest. 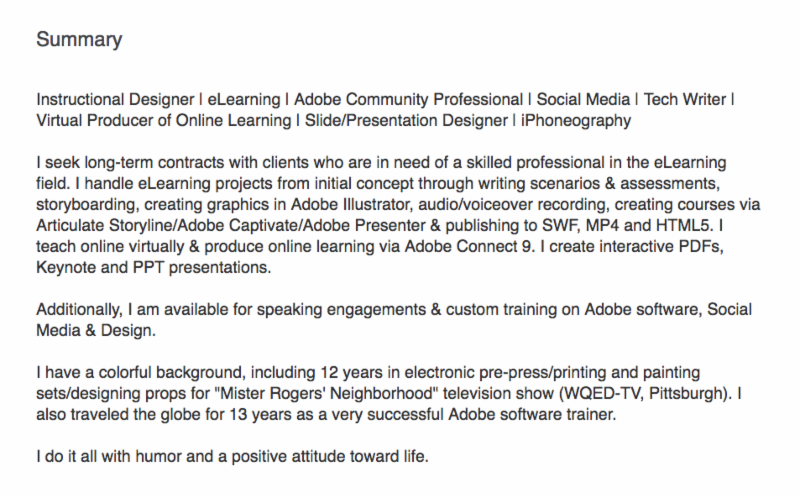 I list my skills on my profile, usually wrapped into my summary. For example, I'm very good in Articulate Storyline. If someone searches for "storyline," I want them to find me! Use the "pipe" character as a separator in your text (it's a vertical line (|) and can be created by pressing [SHIFT] and the key directly above ENTER/RETURN. The pipe gives your profile a fresh look and is a nice alternative to bullets. I used the "pipe" character to separate my roles. I used several keywords and even added a personal touch with my Mr. Rogers story. I typically use the 80/20 rule in social media (80% business, 20% personal). However, on LinkedIn I usually do 90% business. It's nice to offer recruiters a glimpse at your personality, but I recommend that you keep personal content to a minimum. Don't cut yourself out of a group shot and expect that to be sufficient. Spend the money for a professional shot, or trade services with a photographer. Perhaps you can design their business card in exchange for a handful of head shots? Try to find a way to show your personality, even with a formal portrait. Wear a polka dot dress (like me! ), or a colorful pocket handkerchief - just something that helps set you apart. Don't waste a minute on LinkedIn Endorsements. When you add skills to your profile, those skills are seen by your connections. They are then asked to click a button to endorse you for that skill. It's a total waste of time and doesn't hold any weight in the eyes of a recruiter. Don't ask for 100 in one day. I always tell people to ask for two a week. Pick two of your connections who would be strong references for you, and ask them to write a recommendation. Each recommendation has a timestamp, so 100 in one day would be painfully obvious. Although it's customary to recommend someone who recommended you, don't recommend someone you would not hire. It's your reputation on the line - don't risk it over hurting someone's feelings because you refuse to recommend them. It's ok to ask for a recommendation and it's perfectly ok to direct them. I once had some write "Sally is so funny and kind." That's nice to hear but doesn't show my business skills. So I wrote to the person, thanked them and explained I was trying to play up my project management skills. Most people will respond well if you give them specifics on what you want them to emphasize. 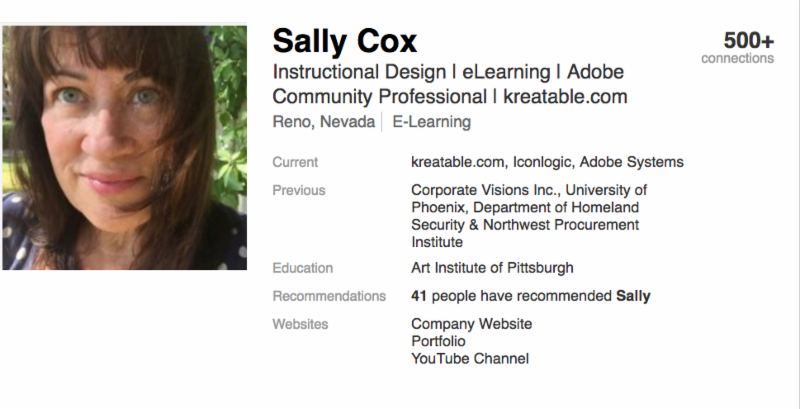 Recommendations are mentioned right at the top of your profile, when viewed by the public. I have 41 recommendations (I have built that list over time). You need to do the same. Make your profile a work in progress and keep it updated so it's ready when you need it. Next time: We'll explore how to actually look for work using LinkedIn, including the LinkedIn jobs app.